Years ago I learned how to cook fresh ham and today I am making some of my recipes. When I butchered my pig, I kept one whole ham. It weighs about twenty pound or more. At the time I thought it would be nice to slowly smoke this large uncured ham for some sort of a barbeque or gathering. As time has slipped away (like it always does), I need to cook it up and rotate some of the meat from my freezer. 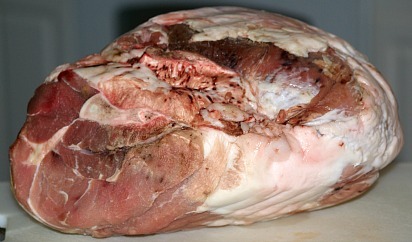 I learned how to cook fresh ham with many different recipes; chosing one is sometimes hard. Those of you who are trying to feed a family and have a busy lifestyle might also like to try what I am doing. When I had all my children at home, I often made many recipes in advance to save time; often saving money also. This process was very important if I knew I was going to be away, especially if I knew ahead that I would be in the hospital. The problem I had in when I learned how to cook fresh ham meals in advance was with my husband. He would read my labels of what I had prepared and often could not decide which he wanted to eat and feed the children. Most of the time he would take two or three meals out at once, coming up short meals before I was able to cook again. Anyway, they were enjoyed very much! Learned how to cook fresh ham by making great sausage which I have run out of completely. It you are just learning how to make sausage you will find it very simple. I am cutting about five pounds of raw meat from this uncured ham and I am grinding it in my food grinder. While I am grinding pork, I want about 1 ½ pounds of it ground to make Italian burgers; I am going to grind 6 ½ pounds of the pork. I learned how to cook fresh ham with many sausage recipes simply by changing the spices. Before I finish with the first of my recipes and add the sausage spices to the ground meat, I am weighing out the 1 ½ pounds for the Italian burgers. The following is the recipe for the Italian burgers. These are wonderful cooked on charcoal grill, under your oven broiler or even cooked in your skillet. Combine and mix pork, garlic, Parmesan, salt, pepper and Italian seasoning. Shape meat mixture into four or six patties and cook until internal temperature reaches 160F degrees. Combine red wine and olive oil; if cooking burgers in oven or on grill use this to baste. NOTE: If cooking burgers in the skillet, brown them in olive oil until thoroughly cooked; pour wine over burgers and cook a few minutes. 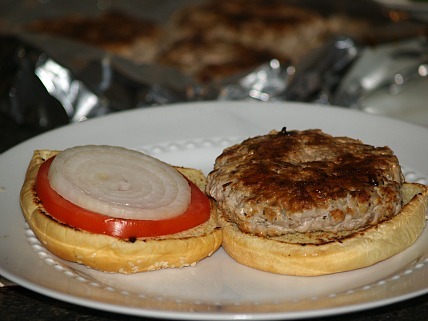 Top with cheese slice and place on hamburger buns; use onion, tomato and lettuce for toppings. Like I said the first of recipes when I learned how to cook fresh ham was definitely sausage because I use a lot of it. With the remaining ground pork which is about five pounds, all you need are some spices. This is a well seasoned sausage which I like. Combine all ingredients and refrigerate; the flavors will blend. I learned how to cook fresh ham by making a pork goulash recipe. It is so good and flavorful with the added spices, sauerkraut and one of my favorite ingredients; sour cream. I am weighing 2 pound of the fresh meat out for this recipe and I want to cut it in 2 inch chunks. In a large Dutch oven combine pork cubes, onion, garlic, dill, caraway seed, salt, bouillon cube and boiling water. Bring to a boil, reduce heat and simmer for 1 hour. Add paprika and stir until dissolved; add sauerkraut and stir to blend. Simmer until meat is tender about 1 hour longer. 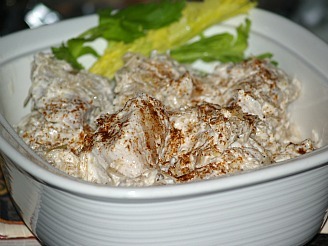 Stir in sour cream and heat until all is hot; serve immediately. One of my favorite recipe when I learned how to cook fresh ham has been this quesadilla recipe; the flavor is fantastic. If you want to make these ahead of time, that can be done. Just prepare the basic meat ingredient and place on tortillas when serving with other ingredients. Combine and blend flour, cumin, chili powder and cayenne in a shallow bowl. Combine eggs and milk in bowl and mix well. Dip pork pieces in egg milk mixture; dredge in flour mixture. Cook in hot oil in large skillet over medium high heat until thoroughly cooked; drain on paper towels. NOTE: At this point you can refrigerate cooked meat for later use; just warm in microwave. Divide pork equally among tortillas; add equal amounts of shredded cheese, tomatoes, lime juice, and salsa. Spay a large skillet with non stick spray. Fold tortillas over (making halves) and brown on both sides until cheese melt. I am going to put the remaining meat and bone in the oven and cook slowly until it falls off the bones. With this meat I will make barbeque pork. Depending how much meat I have after it bakes I might learn how to cook fresh ham creating some new recipes. 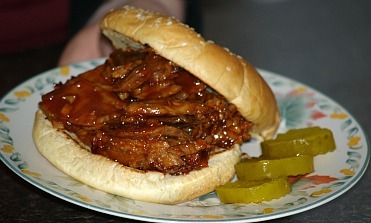 The barbeque pork is delicious on sandwiches and convenient for quick meals. If there is a lot, I can put some in the freezer. The following is a quick and easy barbeque sauce recipe. I have homemade tomato catsup which I canned last year so I am using it in the recipe. Combine all ingredients in heavy stainless steel pan; bring to a boil and simmer 30 minutes. Spoon over meat and toss meat to coat all sides (Amount used is preference of taste and how much meat used).